Congress may not be too popular right now, but the bean soup served there is just as popular as it was over 70 years ago. I was at a microbrew restaurant in Florida a couple of years ago and it was served up there for 35 cents a bowl. It was absolutely delicious, and not just because of the price. Hearty and robust, we all enjoyed a bowl. In his “The Complete Book of Soups and Stews”, Bernard Clayton Jr. provided the recipe that he obtained after enjoying U.S. Senate Bean Soup in 1940. And it is still a wonderful soup today. Either soak the beans covered with water overnight or cover the dried beans with water and boil for a minute and then let sit for one hour. Drain the beans and discard the soaking water. Put the beans and ham in a 5 quart saucepan. Add 3 quarts of cold water, bring to boiling and then simmer gently for 2 hours. When the beans have simmered for 2 hours, add the onion, garlic, celery, parsley and mashed potato to the pot. Simmer for 1 hour or until the beans are tender. Remove the bones and meat from the pot. Dice the meat into ½ inch pieces and return to pot. Discard the bones. You can garnish with chopped parsley or chives. You don’t have to campaign to enjoy U.S. Senate bean soup. You can make it yourself and enjoy it without counting votes. This bean soup sounds just about perfect. I love the mashed potatoes as a thickener, too. Now that looks like a hearty meal! I wonder how this soup got its name. U.S. Senate--there aren't many meals named after the government! ANDREA THE KITCHEN WITCH: Its been popular a long long time, so I guess it is perfect. Thanks. PLATEFUL: Yeah it's a stick to your ribs kind of soup. LYNN PROCTOR: It got cold the past couple days, in the 40's, so this soup would be perfection today. THE GOLDEN EAGLE: It is called that because years ago (over one hundred, probably) a Senator (nobody remembers which one) requested this soup and the cooks said okay they would make it. It got so popular that visitors from everywhere requested it. 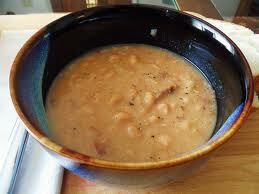 It got to be called senate bean soup or U.S. senate bean soup. Technically it has nothing to do with government, which is a good thing. Wow, I can really see why this bean soup was (andd still continuing to be) so popular! Loved this recipe! Reading that recipe is making me hungry... I wonder if I have those ingredients for tonight's dinner? My husband likes bean soup, so I'll have to give this recipe a try. Different from how I make it. Great recipe. I'll make it soon. Just the sort of thing I like. PU8RABI NAHA: Yes, thank you, it ia a very delicious old soup. LYNDA R YOUNG: It's possible that you already have all these vittles in your pantry. If so, you can whip this up in a jiffy. SUSANNE DRAZIC: This is a bean soup for the two of you, he'll be ecstatic when you all sip it. FRANCENE STANLEY: Good for you, glad that you like it.